Did you know you could earn almost $100,000 more a year with a different compensation model? Without the fear of losing your book of business and starting from scratch, the transition would be an easy decision. Unfortunately, common roadblocks such as noncompete and nondisclosure agreements can make the transition to a new agency more challenging and risky than most producers would like. A nondisclosure agreement (NDA), also known as a confidentiality agreement, is a legal contract between two parties (typically an employer and employee) restricting the sharing of confidential material, knowledge, or information with third parties. NDAs help prevent financial damage in the event that an employee uses proprietary information to compete with a previous employer. After you’ve signed an NDA, you may feel locked into the agency. There are ways you can move on or continue advancing in your career even after signing the agreement, however. What Do You Do If You Want to Leave Your Current Agency? If you’re looking to leave your current agency for a better opportunity, you should hire an attorney to review any restrictive covenants you have signed and discuss your options. Compared to noncompete agreements, NDAs are more likely to be upheld in court as many states throughout the United States have concluded noncompete agreements restrict competition and free trade. While you consider your future as an insurance producer, remember you have options other than the traditional corporate agency. Entrepreneurial or lifestyle agencies are more producer-focused than corporate agencies. They typically provide more flexibility and higher compensation for both new and renewing clients, as well as flexible schedules and options for equity in the business. Leaving your current position as a top producer can seem frightening. 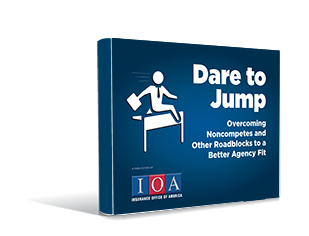 If you are considering whether to make the jump to a new type of agency, download our complimentary eBook, “Dare to Jump: Overcoming Noncompetes and Other Roadblocks to a Better Agency Fit.” We break down restrictive covenants, financial concerns, and other roadblocks that may be keeping you from moving to a better agency.